Clipped this one from a magazine (who knows when or from where) and didn’t make too many changes. 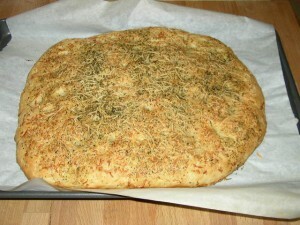 Compared it with several MUCH more complicated recipes for focaccia and decided that I would try the easy recipe FIRST . . . it turned out great. I’m sure the recipes requiring sponges and all-day-multiple-rises are super, but for me, I’ll stick with this simple version. Whisk together the flour, undissolved yeast, sugar, and salt in a large bowl. Add water and 2 tablespoons of the olive oil. Stir together with a fork until well mixed. The dough will be very sticky. Using a greased spatula, spread the dough on the prepared baking sheet. It will NOT fill the whole sheet. Leave it about 9×12″ and 1/2″ thick (see note below). Cover with oiled plastic wrap. Let rise until doubled, 30-60 minutes. Poke multiple “dents” into the dough with the end of the handle of a wooden spoon. Drizzle 2 tablespoons of olive oil over the dough; sprinkle with the parmesan and italian herb seasoning. Let rise an additional 15 minutes, uncovered, while the oven preheats to 375°F. Bake 30-35 minutes until lightly browned. Cool slightly and cut into slices; serve warm with butter or additional olive oil for dipping. NOTE: The original instructions used a 9×13″ pan, but when I’ve tried that in the past, I had difficulty getting the bread OUT of the pan later. Leaving it more free-form on a baking sheet works better for me.